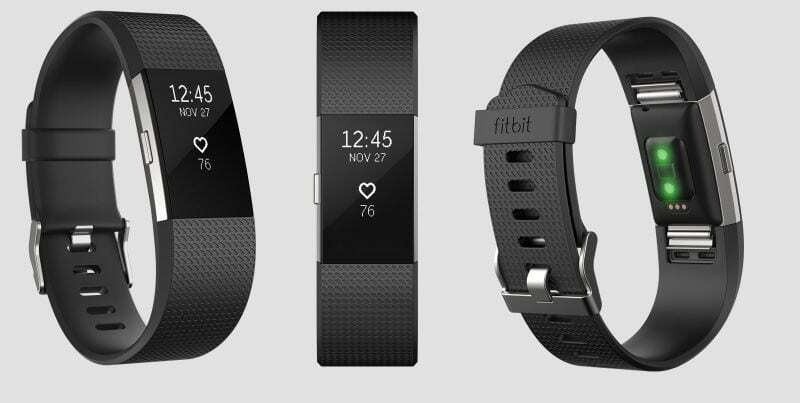 The Fitbit Charge 2 when compared to its predecessors Fitbit Charge, Fitbit Alta, Fitbit Blaze, Fitbit Flex 2, Fitbit Ionic and Fitbit Charge HR comes with some interesting upgrades. These new upgrades include regulated breathing, a larger screen, new data tracking with VO2 Max and interchangeable bands. The Fitbit Charge 2 is more of a Fitness tracker than smartwatch with its health monitoring features. Fitbit which specialises in advanced and easy to use fitness monitoring devices with exercise, sleep, heart rate monitoring and much more. The device requires little user interaction but is however complicated when it comes to its usage. Metrics is navigated by tapping on the screen after which you cycle through them by pressing the side button and then scroll through the exercises by swiping down the screen. The Fitbit Charge 2 is sleeker with a bigger white and black OLED screen which is about four times the size of the old Fitbit Charge watch. With a more stylish looking, sleek and polished silver body similar to that of Alta HR. The display is much bigger and its information easier to read compared to its predecessor but still smaller. It comes with an automatic exercise tracking feature which is useful for monitoring workout from start to finish. To access a particular mode, you have to press and hold the side button. The breath mode has been improved to include haptic feedback feature to improve your experience further.These let you know when to exhale and inhale by slight vibration of the watch mean you don’t have to keep looking at the watch, and actually be at ease. The Fitbit Charge 2 has an easily replaceable strap that can be removed by pulling it out from the clip on both sides of the tracker if you wish to change the straps. The straps come in multiple colours like black, dark blue, purple and light blue with additional premium options for fashion-conscious users are black/gunmetal and rose gold/lavender. Although the straps are much harder to replace than expected. Some improvements have been made to the texture and material making it more comfortable. The responsiveness of the touchscreen is also questionable sometimes as it doesn’t register the turn of the arm and the screen illumination sometimes doesn’t come up when it should. Protruding from the back of the watch but doesn’t have a significant effect on the comfort of the watch. The charge 2 is water resistant but not waterproof meaning it is not affected by sweat but cannot be taken into the bathroom or swimming. Specific workouts are tracked manually by long pressing the side button with a detailed summary available in the app later. Also incorporated into the Fitbit Charge 2 is the SmartTrack which automatically monitors cycling, running, floors climbed, sleep and more. With in-depth tracking of sleep, it tracks different sleep stages like when you wake and when you sleep as well as tips for having a better sleep. Finally, the Charge 2 comes with App support that shows notification on apps like Facebook Messenger and Whatsapp. Battery life lasts for like five days and does a pretty good work in terms of monitoring one’s fitness.